There has always been a certain magic about the city of Baltimore to me. First off, Milbourne Christopher, Hen Fetch, Johnny Eck, Phil Thomas, Denny Haney, and a host of others were born there. And even more lived there like Henry Ridgely Evans, Thomas Worthington, and it was home to the Demon's Clubhouse and The Society of Osiris Magicians. In 1908, Harry Kellar passed the mantle of magic on to Howard Thurston, from the stage at Ford's Theatre in Baltimore. And I should mention, I too was born in Baltimore. My Great Great Grandfather was killed in Baltimore. run over by a train while working for the B&O Railroad Company. Which brings me to the photo at the top of the page. The photo was taken from the B&O Railroad Building on Charles St. in Baltimore. The crowd is watching Houdini free himself while hanging upside down in a straitjacket in front of the Sun Building on April 26, 1916. The photo is of the crowd, which has been mistakenly printed as 500,000 on several websites. It is actually a crowd of 50,000. You may note, Houdini is not in the picture. He would have been on the far right hand side, IF the photographer had been able to reach out far enough to capture him. 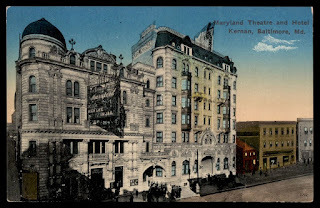 Houdini was appearing at The Maryland Theatre and having quite a run. 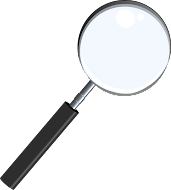 In the Daily Record Newspaper, April 24th, 1916, they say that Houdini has just returned from a trip around the world. They mention his record setting aviation flight in Australia and also the fact he has never been defeated in any challenge. The paper also mentions Houdini is accepting challenges from all comers. And when not attempting to defeat a challenger, he will be introducing his original invention, The Chinese Water Torture Cell. 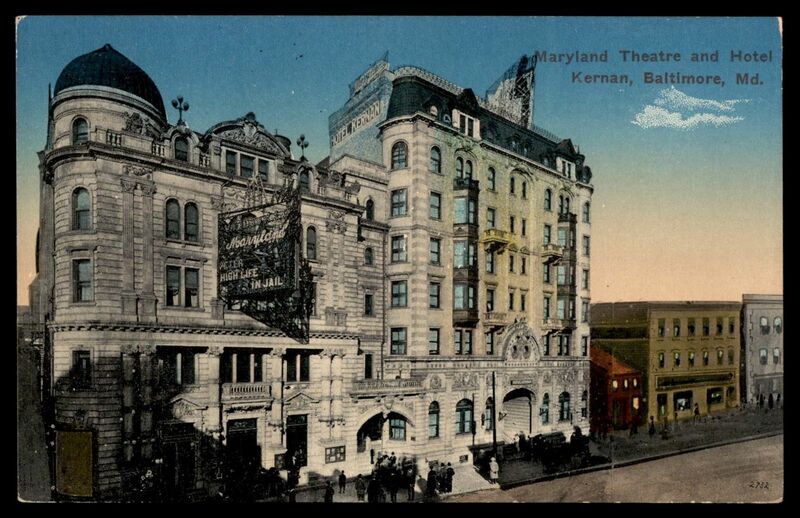 The postcard image to the left shows one of the few pictures of the Maryland Theatre in Baltimore. The theatre is the slightly shorter building on the left hand side of the image. The taller building attached is the Kernan Hotel. Neither building is standing today. Houdini Upside down from the cornice of the Balt. Sun Bld. The Baltimore Sun has an interesting take on his straitjacket escape. The headline reads, "HOUDINI SWINGS TODAY". The body of the article mentions that 4 policemen and a sailor will tie up Houdini and THEN they'll place a straitjacket over him and perhaps some handcuffs. This sounds like an odd arrangement, but I suppose it's possible. Further investigation shows that the tying was for his feet, and no handcuffs were added. Houdini declared the escape would take between 10 and 15 minutes. At 12:22pm he was hoisted 50 ft into the air from the corner of the Baltimore Sun Newspaper Building. The police chief was the one who made the estimate of 50,000 people. The paper said the people were so densely packed that it was almost impossible to move! 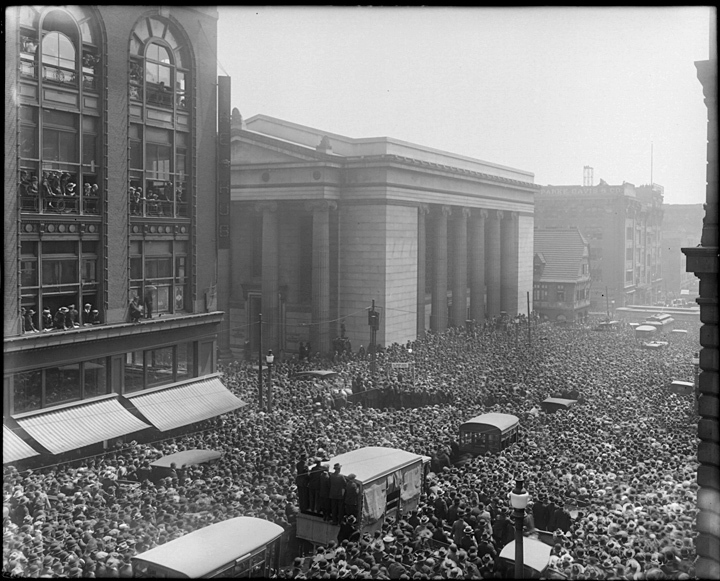 Not only did people fill the streets, but they were hanging out windows and could even be seen from the rooftops of nearby buildings all to catch a glimpse of Houdini's escape. The Baltimore Sun paper also mentions that a wagon was set up so that Houdini and the policemen could stand on it and secure Houdini in place. This also allows the huge crowd to watch every detail of the event take place because of it's higher position. The police chief and police marshall both watched Houdini's escape from an office in the Sun Building, so they likely had the best seat in the house. Bess Houdini stayed on the wagon below, but according to the paper did not watch her husband escape. "I am always afraid" she said after it was over. His straitjacket escape was covered in three papers: The Daily Record, The Baltimore Sun and a German language paper Der Deutsche Correspondent. Houdini was in town to play the Maryland Theatre for a week starting April 24th. According to the Baltimore Sun, Houdini began his act with the East Indian Needle Trick. Following this a short film was shown of Houdini doing a packing crate escape in the Pacific Ocean that apparently took place during the California exposition the previous year. When the short film was over, Houdini then presented his Water Torture Cell. This was day 1 of his week long stay, so no doubt as the week progressed the time was filled with challenges. The Baltimore Sun also has a report on a challenge Houdini received during his run. He was challenged to escape from a Piano Box that would be screwed and nailed shut and then have iron bands placed around it. This from the April 25th edition (day 2 of his week long run) of the Baltimore Sun. Day three he did the Hanging Straitjacket outdoors. But there was also a challenge on Day 3 which appeared as the following: Dear Sir, the undersigned mechanics hereby challenge you to escape from a gibbit we made from heavy irons bands, such as was used many years ago to suspend prisoners in mid-air until death relieved their sufferings." On April 27th, Houdini was challenged to escape from a cask filled with Arrow Beer by the C.B.S. Brewing Company. There is no record of any special challenge on the 28, 29th or 30th. Houdini was in Baltimore numerous times, so I will be covering more about them soon. Great reporting here Dean! 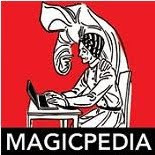 Baltimore does indeed have a magic history, almost as much as Chicago.